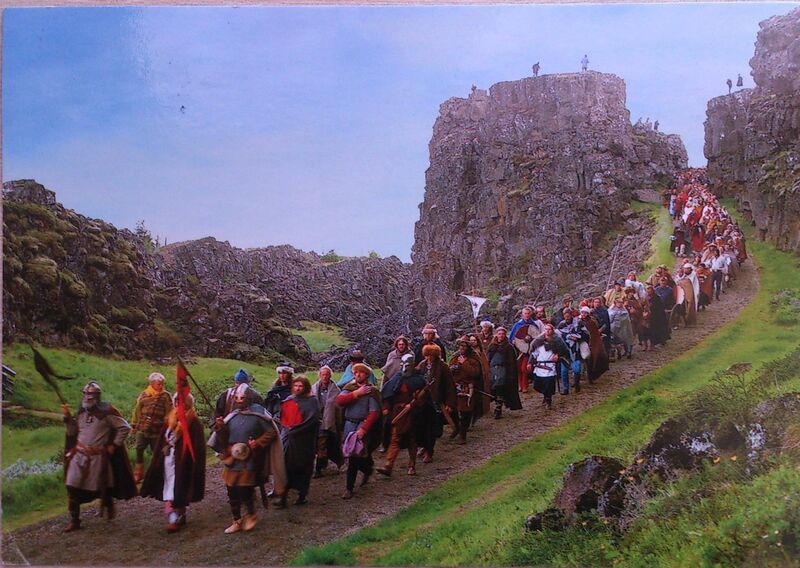 It pictures a viking festival at Almannagjá, Þingvellir (how do I read this?! :D). Þingvellir is a place in Bláskógabyggð in southwestern Iceland, near the peninsula of Reykjanes and the Hengill volcanic area. Þingvellir is a site of historical, cultural, and geological importance and is one of the most popular tourist destinations in Iceland. It is also home to Þingvallavatn, the largest natural lake in Iceland. Parliament or Alþingi was established at Þingvellir in 930 and remained there until 1798. Þingvellir National Park was founded in 1930 to protect the remains of the parliament site and was later expanded to protect natural phenomena in the surrounding area. Þingvellir National Park was the first national park in Iceland and was decreed “a protected national shrine for all Icelanders, the perpetual property of the Icelandic nation under the preservation of parliament, never to be sold or mortgaged.” Þingvellir is also a designated UNESCO World Heritage Site.